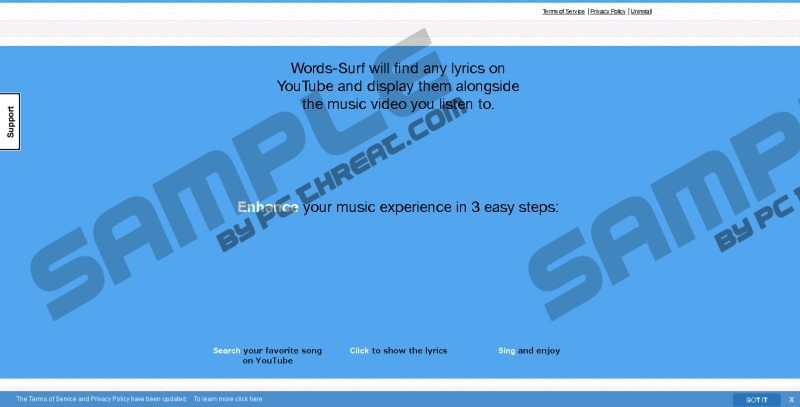 Who would not like to sing along to songs with the help of an application like Words-Surf while watching YouTube music videos? Unfortunately, we need to rain on this “parade” as we are not here to promote this suspicious program; instead, we will tell you how it can endanger your virtual security as an advertising-supported application. Your PC will not be safe anymore if you have this adware on-board because the third-party advertisements it may display on your screen while you are peacefully browsing the web might be unreliable; they might lead you to unsafe websites. And that is not all, of course. This program may also enter your computer along with other malware applications, which could easily bring your operating system to the ground if it is not properly protected or if you are not careful enough. Removing Words-Surf is the only right step towards a clean computer, even though it may not be the last one. To be honest, there is little chance that anyone ever lands on the “official” website at words-surf.com. This is rather just a webpage, and even that is an overstatement. All you can find there is a few lines of promotional words. For example, you will learn that this alleged application “gives you the ability to sing along with every song while watching your favorite music video.” And that is almost all. However, apart from the poor design and lack of information, this page also lacks the most important thing: a download button. How about that? Does it strike you as a reliable application? You can forget about the website anyway, because that is not how this useless adware ends up on your computer. It is more likely that Words-Surf arrives in freeware bundles together with other malware infections, which may include adware programs, browser hijackers, and potentially unwanted programs as well. That is an unfortunate thing since it means multiple security issues for your Windows operating system. If you had an antimalware application active in the background, this could not happen, i.e., installing a whole bundle of malware threats. But, if you are unlucky and careless enough not to opt out in time, you may have to face a number of infections. Deleting Words-Surf will be only the first step in that case, which will have to be followed by the detection and elimination of every other related malware program. Words-Surf promises you fun with lyrics while you are playing karaoke king or queen in front of your screen. But it is possible that this application does not even work properly. There is only one thing you can rely on with regard to this adware, and that is the flow of third-party ads; but not the ads themselves for sure. We do not recommend clicking on any of the advertisements shown by this adware as they might take you to unsafe websites where you could be exposed to unreliable content. You might open the door to more malware attacks or even get scammed by cyber criminals. None of these options can end well for you; that is why we suggest that you delete Words-Surf as soon as possible. Of course, we cannot finish our article without good news, as we cannot leave you without an effective solution. Fortunately, you can easily eliminate Words-Surf if you follow our instructions below. Since this adware has a working uninstaller, once you find it in the list of installed programs, you can simply uninstall it. Keep in mind that there may be other threats still endangering your system. We recommend that you use an antimalware application to secure your PC if you do not want to go after every one of the potential infections manually. Quick & tested solution for Words-Surf removal.